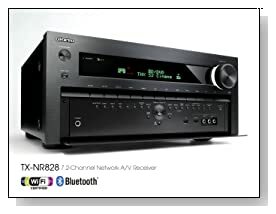 Hundreds of A/V receiver brands and models available in market today but not each of them is worth of buying. High performance, reliable quality and high durability of the product are very important factors to consider while buying home cinema systems. Our team took latest model Onkyo TX-NR828 Audio/Video receiver system for comprehensive review. This is one of the hot selling models from well-known home audio products maker, Onkyo. This model comes with 7.2 channels with 130W/160W per channel. The team found performance of this Audio/Video receiver was outstanding. Rigorous 2000 tests for THX Select2 Plus certification are passed. Extremely clear vocal and powerful Bass at all volume levels. WOW kind of performance both on audio and video. This system has passed more stringent requirements of THX Select2 Plus certification. To clear this certification, the system shouldn’t have distortion more than specified levels when played at cinema volume levels. More than 2000 tests on 75 categories are successfully passed out by this model. This system gives clear vocal and powerful bass at very high volume levels. Surly this will give an amazing experience for all music lovers. This system supports surround sound formats like Dolby TueHD, DTS-HD Master Audio, Dolby Pro Logic IIz, Audyssey DSX with MultEQ® Audyssey room calibration technology. In terms of video output, the system does really a great job with its Qdeo™ technology. This technology upscale standard definition videos to 1080P HD quality. Without saying, this unit performs extremely well with high definition videos. This system cleanly pass-through 4k video source signals from supporting devices. Best audio quality with this great video upscale makes this unit one of the best AVR available in market today. Not just on video nights, you find this system very entertaining everyday. Overall this latest product from well known brand Onkyo performs extremely well and redefines home cinema experience. This model comes with many good features like certified inbuilt Wi-Fi LAN and Bluetooth, Android & iPhone remote app for tablets & smartphones, 3D Ready & ARC, Phase-Matching & Bass Enhancement, internet radio and much more. As a special seasonal offer the company provides one month free tech support to explore all features and make best use of them. This model uses latest technologies for audio/video decoding and offers amazing results. We found this A/V receiver worth for its price.